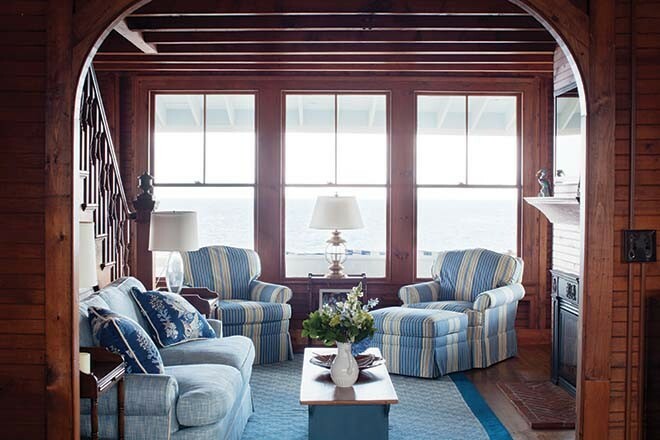 From the Nantucket wicker chairs on the wraparound porch, Lord’s Point is visible in the distance. In the powder room off the kitchen, the homeowners wanted to keep the original lavatory, so Hurlbutt Designs added a gathered sink skirt to cover the pipes. 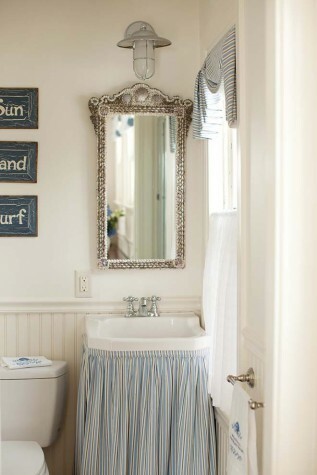 A nautical light fixture, locally crafted shell mirror, and blue-striped T-swag valance lend a beachy feel. “The sheer cafe curtain blowing in the wind reminds me of an Andrew Wyeth painting,” says Hurlbutt. 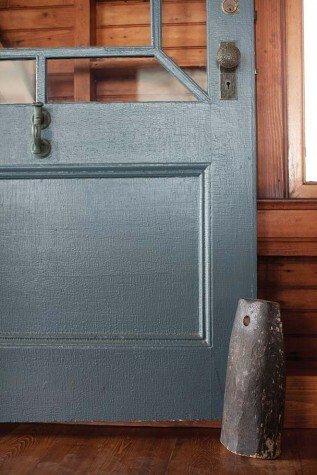 The original front door was painted a deep ocean blue, and the buoy doorstop was found on the porch. Next to it sits a cedar miner’s bench with a custom seat cushion in Cowtan and Tout blue check. A diamond-patterned, bordered sisal carpet from Merida was reused from the previous house. 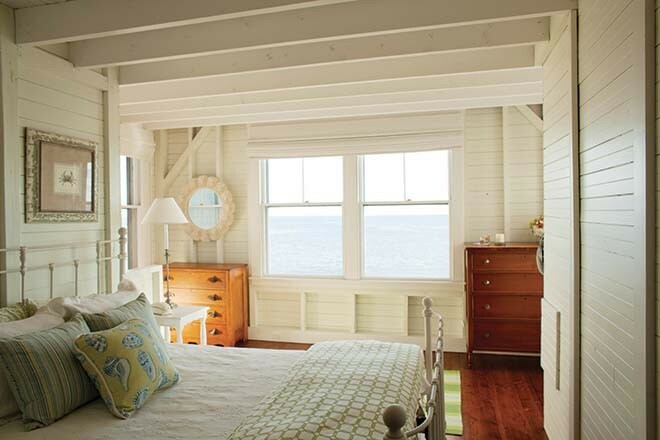 The son’s bedroom was originally two rooms—a tiny bedroom and a sleeping porch. 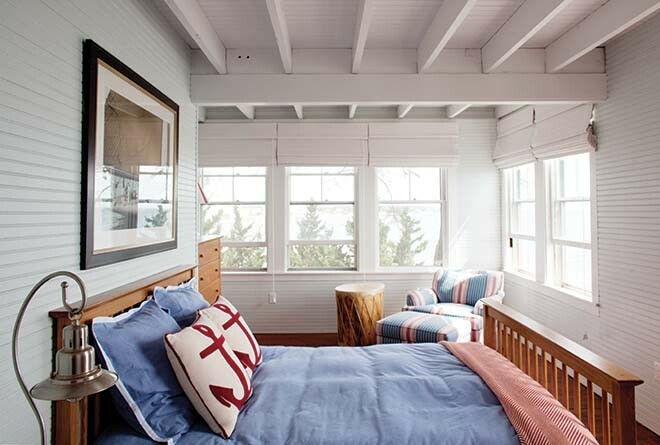 The team removed walls to create a more spacious room with views on two sides and painted the dark beadboard Benjamin Moore’s Lookout Point.Nautical pillows complement a red, white, and blue chair. 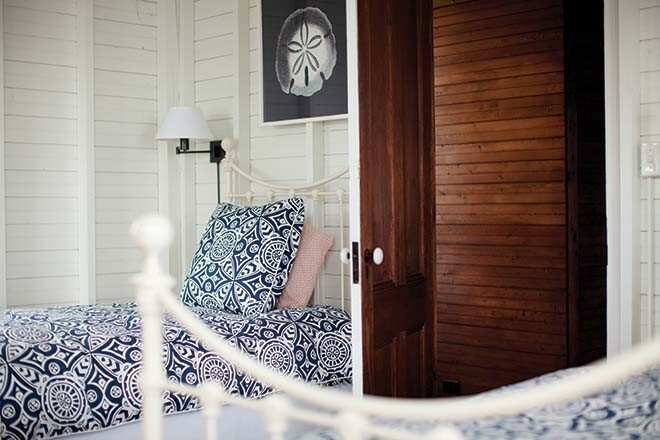 This bedroom with a curved wall is painted in Benjamin Moore’s Pale Straw, the perfect backdrop for the Marimekko bedding and the starfish painting by local artist Lauren Walier. 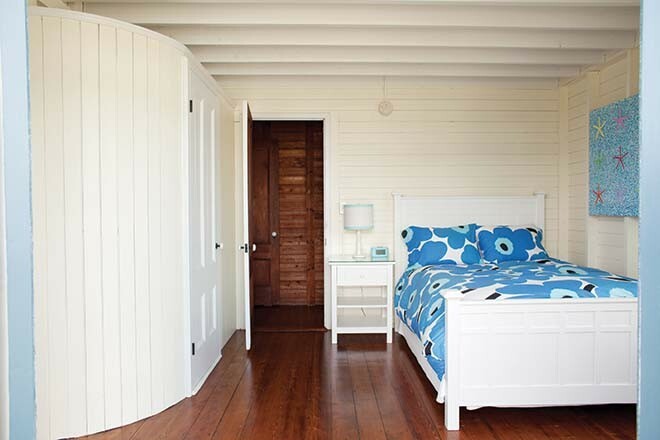 In a girl’s bedroom, Serena and Lily bedding pops against the walls painted in Benjamin Moore’s Snow Angel. A Wendover Art Sea Elements print hangs above an iron bed. The only truly remodeled room in the house, the kitchen features beadboard and upper walls painted in Benjamin Moore’s Acadia White. Refinished pine floors were painted with a blue square pattern “to add style and color and give the space an older feel,” according to interior designer Louise Hurlbutt. 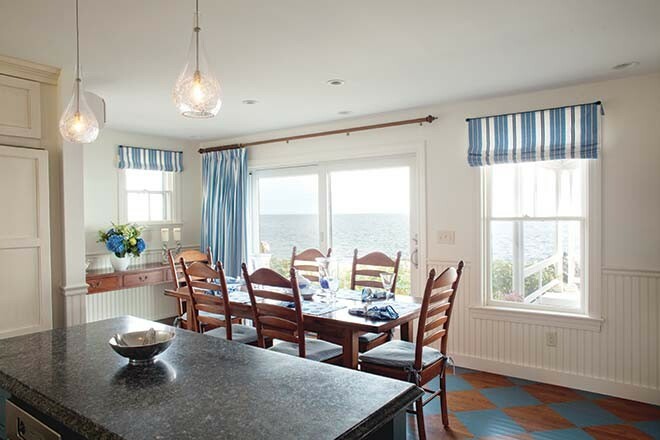 The countertops are honed Blue Pearl granite, chosen to pull in the color of the ocean. The cherry draw-leaf table can open to seat 12, and was custom-made in England for Hurlbutt Designs. The Bedford ladderback chairs and Monopoint clear crackle-glass pendants over the island are also from Hurlbutt Designs. Striped draperies and mock Roman blinds add color and protection from the sun. The previous owners added the sliding door to open up the view and allow access to the porch. The front door opens to a large entry vestibule with a fireplace (above). 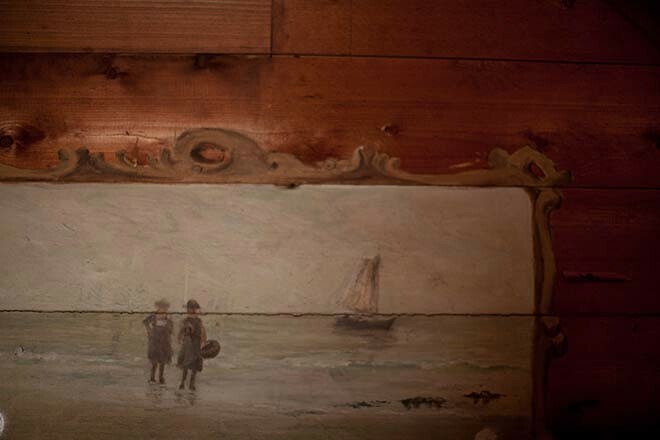 The beach rose motif over the mantel is one of many hand-painted accents by the former owners that the homeowners kept intact. 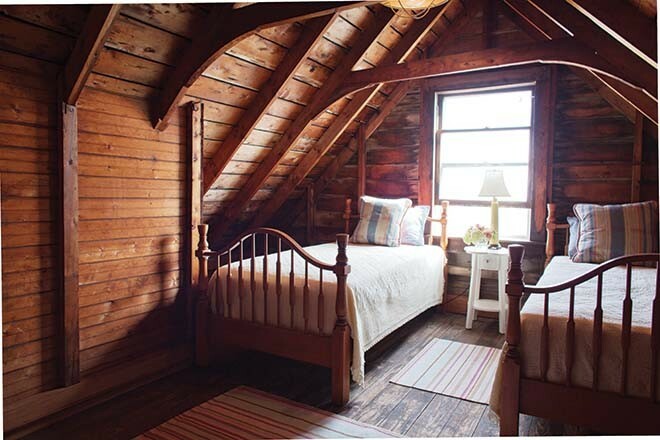 The original wooden beams, mantels, and beadboard walls were carefully restored by a team of women who washed, oiled, and refinished them. The antique daybed sofa is made of Kauri pine from Australia, and a Palecek Chair features Brunschwig & Fils striped fabric cushions. In the family room, a Charles Stewart sofa and chairs from the homeowners’ previous house fit nicely into the new floor plan. The sofa was reupholstered in Brunschwig & Fils fabric with custom pillows. 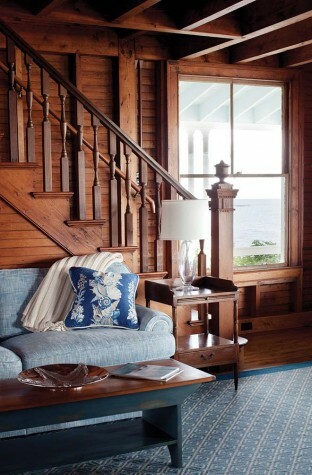 An antique pine-topped coffee table, Norfolk oak side tables, brass ship’s lantern table lamp, and a handmade wool needlepoint rug in a Greek fret design are from Hurlbutt Designs. 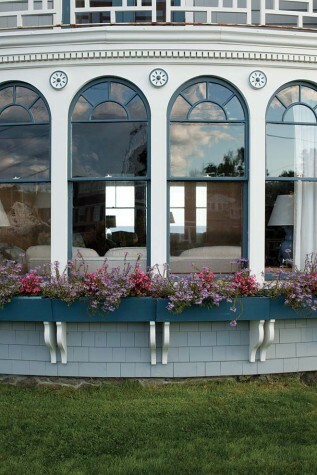 Under original bay windows with bowed glass (opposite), the window boxes bloom with New Guinea impatiens and scaevola. 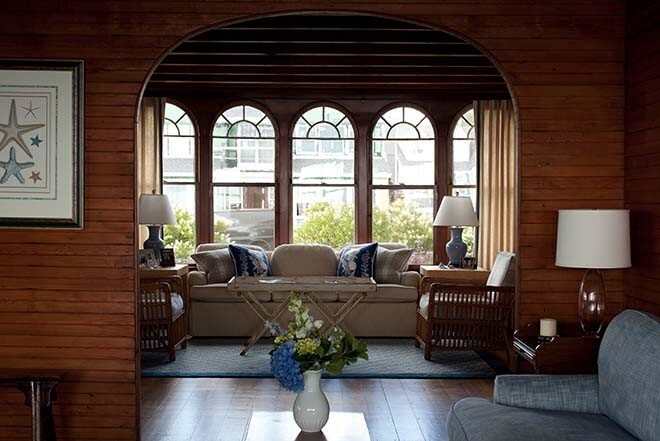 The trim around the windows and fretwork was painted the same deep ocean blue as the front door. 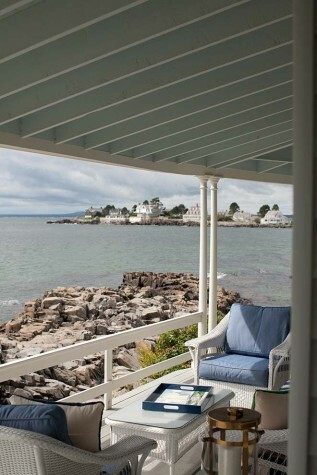 The wraparound porch of this 1880s Victorian home on the rocks overlooking Kennebunk Beach offers a stunning ocean vista. The windows, front door, and gingerbread trim are all original. The coastline of the Kennebunks is classically scenic, a graceful undulation of points, necks, and crescents shaped by sandy swath and rocky ledge. Along this shoreline is a smattering of historic homes with the sea at their feet—as much a part of the landscape as its natural features. They are landmarks, points of reference, living relics in an evolving town. One of these antique homes sits along Beach Avenue. 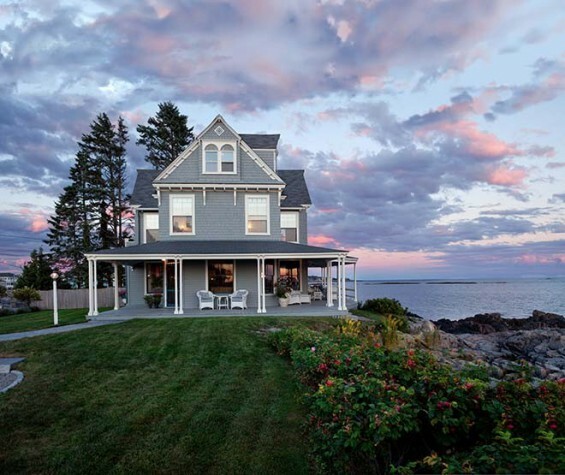 Anyone who’s driven by knows it: a Victorian on the rocks with a grassy patch leading to an open porch leading to open ocean. Built in the 1880s (after a fire burned down the original house in 1860), the house’s other-era charm is what first attracted Michael and Barbara Neuberger. The Massachusetts couple has been coming to Maine for more than 15 years, first as renters then as summer residents. They timed their visits with the Kennebunk Beach Improvement Association summer program, which their four children participated in every year. Their first home was right around the corner from Beach Avenue; it was an old home they had renovated. 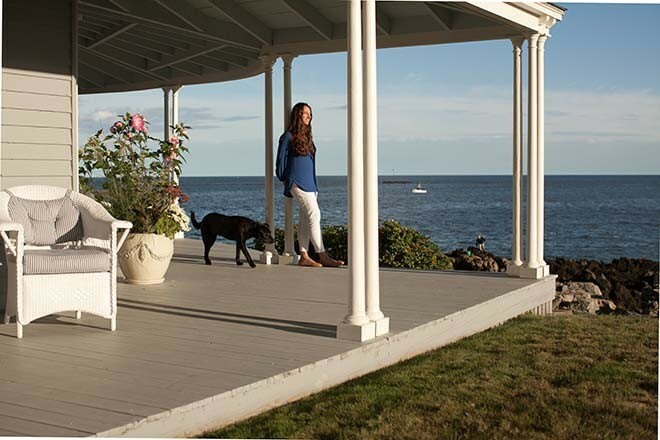 For many years, during their walks and runs along the beach, they admired the Victorian’s architecture and its location right at the edge of the ocean. 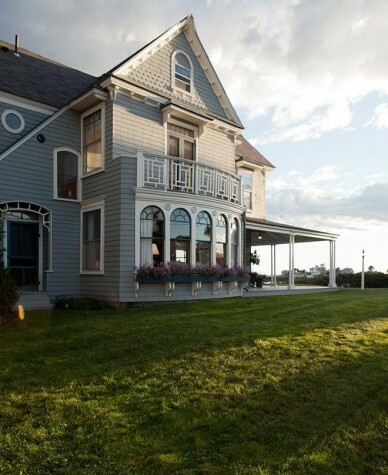 “It’s a proud home that has stood almost untouched for many years overlooking the water,” says Barbara. Needless to say, when the place went on the market, they jumped. When you have a home like this, you hang on to it. As it turned out, the Neubergers were only the second family to own the house, having purchased it from a descendant of the original family. The seasonal cottage had been passed down through the generations but had remained largely untouched for many decades. The plumbing and electrical systems were out of date, as were the kitchen and baths. In addition, many of the bedrooms had wood-burning stoves and fireplaces that would need to be removed. The Neubergers’ goal was to make the necessary functional updates while preserving the look and feel of the house, maintaining as much of the architecture inside and out as possible, and keeping a mix of formal designs and casual spaces. 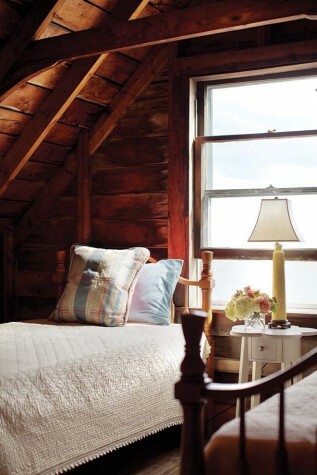 The Neubergers’ first call was to local interior designer Louise Hurlbutt of Hurlbutt Designs, who had helped the couple renovate their first Kennebunk home about a decade ago and is a knowledgeable resource when it comes to old seasonal cottages. “She really acted as our spiritual, architectural, and design consultant,” says Barbara. 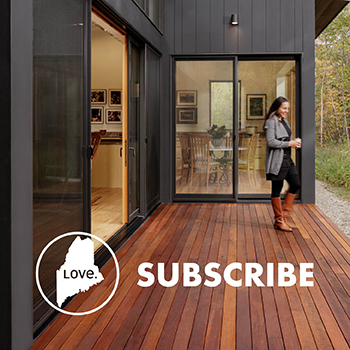 “We were living in Massachusetts, so Louise ended up being our eyes and ears for the project.” For a builder, the Neubergers wanted a partner who understood the area. “We had known Ben Young of Bennett Young Construction for several years and really loved that he lived in Kennebunk Beach and that he had known our home since childhood,” says Barbara. “You could tell that Ben loved the idea of working on this house from our first meeting. 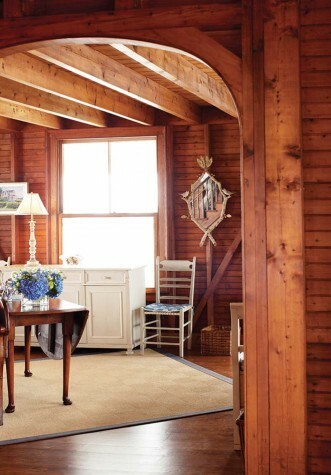 He was wonderfully creative and came up with numerous solutions to problems that seemed insurmountable.” (Young and Hurlbutt had worked together on another historic cottage in Kennebunk a few years before.) Among Young’s clever solutions was figuring out how to hide all the electrical wires and plumbing to preserve the look and feel of the house and avoid putting up wallboard. He also helped remodel the kitchen to work around a major structural beam that is needed to support the second floor. The team opened up the kitchen and added an island as well as cabinetry by Sylco Cabinetry. 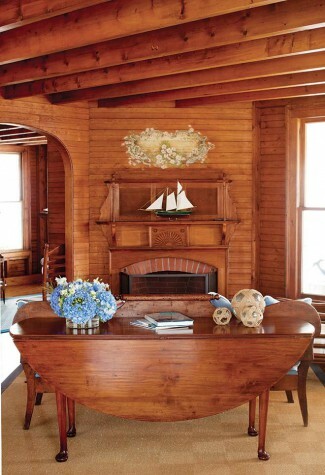 Keeping the beadboard and beams intact was a challenge due to the age of the wood. “If we insulated the house, we would lose the old stained beadboard,” explains Hurlbutt, who grew up summering in a similar house. But the walls and windowsills were plagued with water stains that had turned gray. 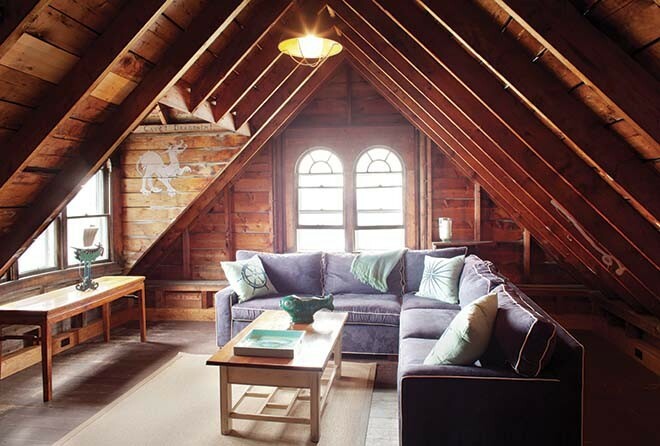 The designers hired four women who used to take care of old cottages in Goose Rocks and Biddeford Pool. 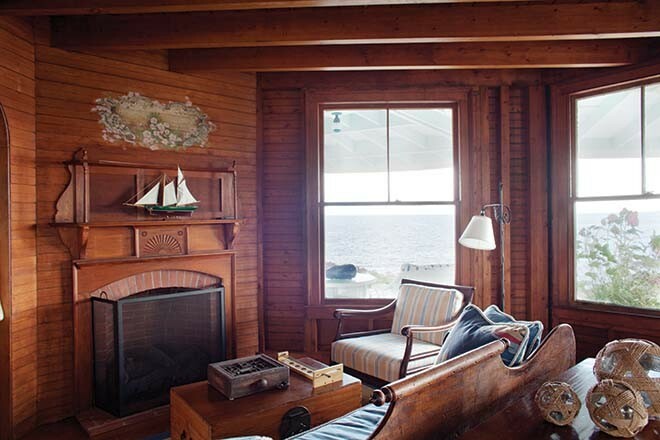 They painstakingly washed all the stained beadboard, then, by hand, rubbed all the walls and woodwork with an oil to rejuvenate it. “It truly brought it back to life and made a huge difference,” says Hurlbutt. On the second floor, the designers departed from the dark walls, choosing to paint them lighter colors so the children’s bedrooms would be inviting and airy. The process took weeks, according to Hurlbutt, because the old wood kept absorbing all the paint. 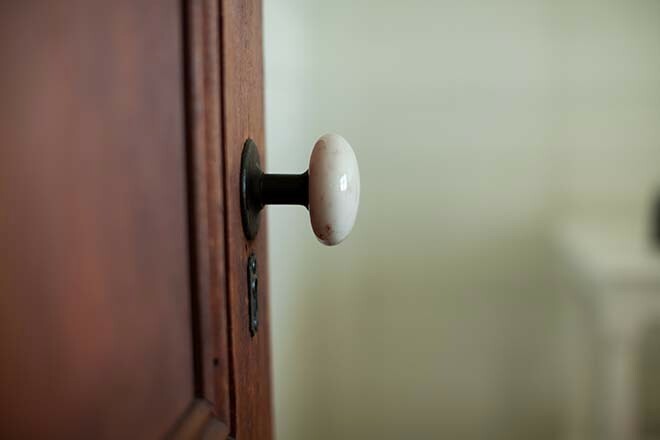 Throughout the house, a mixture of beauty, comfort, and history coexist in a careful balance. With their four children adults now, the Neubergers wanted a house that could be lived in, relaxed in, and enjoyed. “We wanted to keep it architecturally authentic,” says Barbara, “and comfortable for our family.” Hurlbutt and designer Bonnie Weeman crafted an interior palette that is worthy of the home’s historic context but also functional and informal for the family of six, starting with what they had. The Neubergers were able to reuse their furniture and rugs from the previous house. Hurlbutt and Weeman created furniture floor plans for the new house, substituting some new items or reupholstered pieces here and there. “When I design,” says Hurlbutt, “I make the first floor of a house flow together color-wise so that, if and when the homeowners move, they can move furniture around to fit the space, and the colors still work together.” The palette contains bright blues and yellows—which pop against the stained wood. 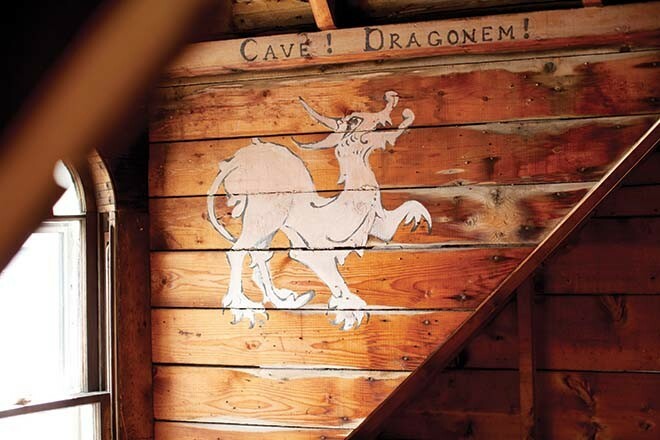 The Neubergers also kept the home’s painted wall scenes (a dragon and beach scene in the attic, a bunch of beach roses over a fireplace downstairs), which they suspect were done by an artistic member of the previous family. The result is an authentically designed interior that is both true to its time period and updated with the conveniences necessary for a modern family. 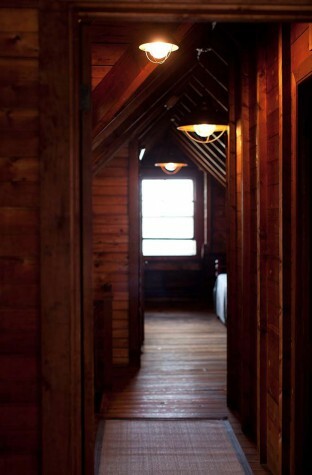 Just as the inside of the house is a testament to authenticity, so too is the outside. The homeowners worked with landscape designer Ted Carter, who—like Hurlbutt—had worked with them on their first home. Since hardly any landscaping was done back in the days when the house was built, according to Carter, the landscape design was kept minimal. He helped to modify the walkways and driveway, as well as the plantings, so that the landscape would accent the ocean as much as possible. He and the Neubergers discussed installing plants that would have been planted in the 1880s to further maintain that true-to-the-time-period look and feel. Along the road, Carter chose the vintage tree hydrangeas planted in colonnade fashion with low ornamental grasses below. “Ted really connected with the house and its location,” says Barbara. The Neubergers are hopeful that the house will remain in their family for a long time, as it did with its previous owners. They take comfort in knowing they’ve performed an honest restoration—one that will usher a grand old home into its next 100 years on Kennebunk Beach.